All these delicious and fair CBD products in this category have in common that they contribute to a healthier lifestyle. Thanks to the wide and beneficial applicability of CBD, products such as CBD oil, CBD capsules and CBD ointment exist. CBD products contain the special and healthy substance Cannabidiol (CBD). What all these CBD products in this category have in common is that they contribute to a healthier lifestyle. At the Dutch-Headshop, we have an ample CBD product offer of the very best labels. Whether you are looking for soothing CBD ointment or concentrated CBD paste; Dutch-Headshop has it all. CBD is a substance found in the hemp plant and its shape is similar to the body's own substances anandamide and 2-AG. Therefore, these substances influence the body's own cannabinoid system, and CBD consequently has an effect on the immune system and cognitive and motor functions. CBD is not psychoactive. You will not get high or stoned from CBD. CBD ensures the nervous system responds differently to the body's signals, among other effects. 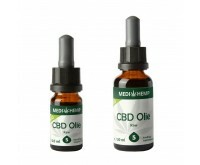 The most important producer of high-quality CBD oil is undoubtedly MediHemp. The Austrian family business was founded several years ago, based on the desire to be less dependent on chemical medicines, but still with the ability to combat all kinds of diseases. Quality is a measurable concept. The producers of our delicious and fair CBD product are also aware of that. Therefore, quality is ensured through analyzes. This way, you know exactly which and how much cannabinoids your CBD oil contains. Simply order the very best CBD products at the Dutch-Headshop.